Meet your new favorite weeknight dinner. It asks only a few things of you: that you have a cluster of esoteric ingredients on hand (chili paste, rice vinegar, toasted sesame oil), and also a few familiar ones (ginger, soy sauce, peanut butter). 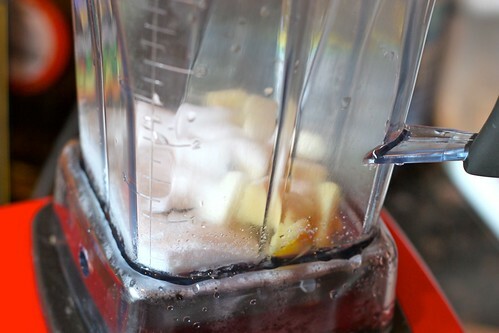 It asks you to boil water and to blend things up in your blender. But approximately 20 minutes after you start, you’ll have the plate of food that you see above and, on a hot summer’s eve, you’ll find that very satisfying. The dish comes from the new cookbook “In The Small Kitchen” by authors Cara Eisenpress and Phoebe Lapine (of Big Girls, Small Kitchen) who, just yesterday morning, made an appearance in my kitchen for the next installment of “Someone’s In The Kitchen With…” (post forthcoming). And like The Barefoot Contessa’s best recipes, their noodle dish doesn’t skimp on flavor. You get the heat from the ginger, garlic and chili paste, the sweetness from the peanut butter (and sugar, though next time I’ll try honey), and a healthful, vegetal kick from the scallions and cucumber. My only complaint is that this is so good, you’ll want more, so consider doubling the recipe. Here’s how you make it…. 1. 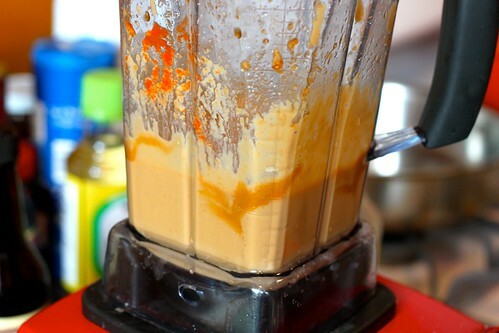 Pulse the ginger, garlic, and sugar in a food processor or blender until the mixture resembles a paste. 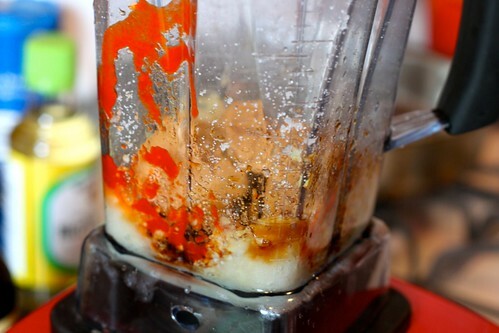 Add the chili paste, peanut butter, soy sauce, Worcestershire sauce, rice vinegar, and sesame oil. 2. When you’re ready to make the dish, bring a large pot of salted water to a boil. Cook the noodles, following the package directions. 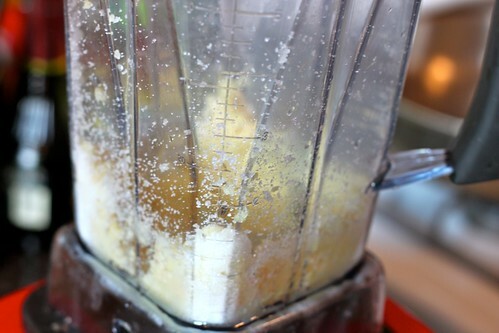 Then drain, rinse with cold water until chilled, and toss with the vegetable oil. 3. 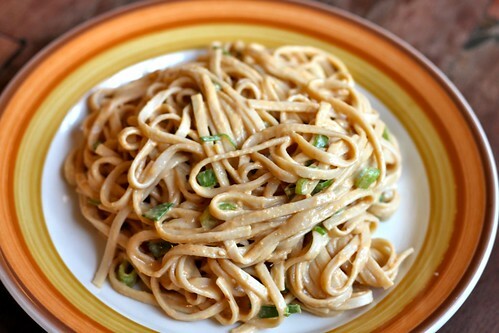 In a large mixing bowl, toss the noodles with the peanut sauce. Serve in individual portions, topped with the scallions, cucumbers, and toasted sesame seeds.